“Why haven’t you submitted a video for the Business Model Canvas Competition?” Wen Teoh, the Venture Start Director at the EPICentre was standing over my shoulder as I pulled my headphones out of my ears. My team and I had been so busy developing that it had slipped our mind. I had been using the Business Model Canvas (BMC) since I started this project back in May, so I really didn’t have an excuse not to. Luckily, our CTO Stevan Ljuljdurovic also doubles as a Twitch streamer, so for the next 24 hours I wrote a presentation and recorded the video submission. Before I go on, let me explain what we are. AidaNote is a distributed speech-to-text accessibility tool that provides real-time transcriptions to the audience of any speaker. With a focus on accessibility, we have developed intuitive note-taking tools designed to make the classroom a more inclusive space for students with disabilities. Come Fall 2019, students registered with Student Accessibility Services across Ontario will have the opportunity to opt-in their classes for AidaNote integration. When I got the acceptance email from the EPICentre, I emailed my mentors David Kirby and Maureen Lucas to get some feedback on what needed to change. In the 6 months that I had been working out of the EPICentre, I had 7 BMCs to show and that was the jist of my presentation. Dave sat down and basically told me to change everything (and he was 100% right). “The colours are wrong.” “Showing seven BMCs in a row with nine boxes in information-overload.” Maureen helped me by asking me the hard questions that judges might ask. “What are your projections?” “What is the market really like?” I changed everything. I broke the boxes down, I dissected our most important pivots, I added colours and icons and a personal piece about the inspiration for this project. Meanwhile, Stevan worked with our other developer on getting the demo working. What good were all these business models if we really didn’t have anything to show for the tech? We both pulled through. With the demo being completed the Wednesday before the event, I spent all day Thursday designing the front-end and adding the finishing touches to the final presentation. Friday, November 9th, we walked into the EPICenter as we did every other day, but today we were greeted with swag bags (filled with delicious snacks) and the office was filled with fresh faces. 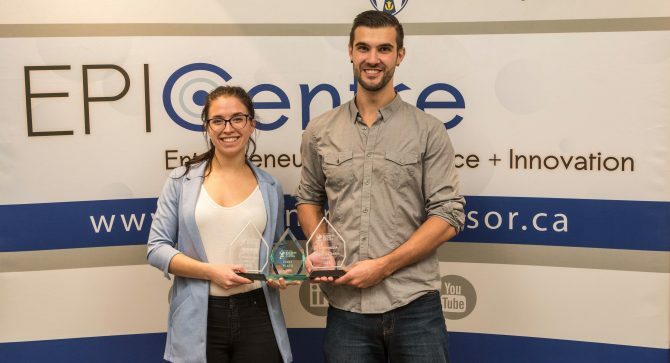 Fifteen teams from all over Ontario travelled to the University of Windsor to show off their startup and the chance to win the top prize. The night started with a great ice-breaker event where everyone got the chance to introduce themselves and their startup ideas. Every individual in the room was working in such a unique space, it was a breath of fresh air to hear their stories and feel their enthusiasm. Next, we got to hear from other local entrepreneurs. The insightful panel consisted of Karolyn Hart, Founder and CEO of InspireHUB; John Savage, Founder and CEO of Cypher Systems Group; and Stephen Cheifetz, Corporate and Commercial Lawyer at Corrent & Macri LLP. After dinner, the teams broke off with their assigned mentors and practised in separate rooms until 9 pm. Well, most teams, our mentor wasn’t able to make it due to some fresh snowfall which lead to a cancelled flight (hello, winter). Luckily, I’d had mentorship prior to the event, so Stevan and I didn’t have many changes to make that night, so we focused on practising. Saturday morning, I was grateful to walk into the Odette School of Business to find that hot breakfast and coffee awaited the arrival of the participants. We were instructed to load our presentations on the computers provided for us. Now, I have a bone to pick with PowerPoint. I spent a long time working on a custom slide deck with tailored designs, only to have all of that changed when I put it on another computer. (I know I must be missing something, but if anyone knows how to stop this from happening, let me know!) Instead, I took the chance of running an HDMI cord to my laptop in order to do the presentation. Of the fifteen teams competing, seven were announced as successful to move on the final round. AidaNote was one of them. We were given an hour to change our presentation and then back on stage to present to all the participating teams and our panel of judges. I remember watching the other teams go up and being inspired at their presentations. Everyone spoke eloquently and their presentations were extremely professional. AidaNote presented fourth, and again, I had to use the provided HDMI cord in order to have the designs on the presentation remain the same. Everything was going great, until it was time for the handoff. I walked over to the laptop, went to tab-over into the browser so Stevan could start the demo, and I knocked the HDMI cord out of its connection. In a large auditorium, the connection can take a while to come back on to the displays. I was ready to start panicking when in the background I heard Stevan laugh it off. “Well, let me describe to you what you’re supposed to be seeing.” I heard a few laughs from the audience and it was enough relief to wash away the panic. The audience was able to see fifteen seconds of the planned forty-five-second demo, we closed, we breathed that sigh of relief. It was in the hands of the judges, sure the demo had been botched, but we couldn’t change anything at that point. We’d worked hard, we gave it our all and we were proud of that. The reception after the presentations were a much-needed relief, we got ourselves and drink, munched on some hors-d’oeuvres and waited for the judges to confer. There were four awards up for grabs: * First Place – $10,000 Cash, 6 months of desk space at the EPICentre and automatic qualifier to Canada’s Business Model Canvas in Halifax * Second Place – $2,500 Cash and 6 months of desk space at the EPICentre * People’s Choice Award – $2,000 in kind of Postmedia advertising * KPMG Financial Competence Award – $750 Cash. The last two awards were open to all participating teams, not just the finalists. When it finally came time to announce the winners, everyone was anxious and excited. The first award that was announce was KPMG Financial Competence Award. “The winner is Aida.” I didn’t think it was us. We are clapping for the winner and looking around as nobody walks forward to claim the award. “Oh, sorry, AidaNote.” My jaw dropped, we accepted the award and took our spot amongst our new-found peers. Next, Postmedia announced their award. Again, our name was called, and again, we humbly accepted the award. In my mind, we got third place, I was so excited that despite having ruined the demo, we were still able to place ourselves on the leaderboard. Second place was announced and the winners were Roll-up, a social enterprise working out of London that provides affordable refurbished wheelchairs. Their presentation was awesome, their mission is amazing and they are really making a difference in the lives of people who require a wheelchair (you should look them up!). The interim president of the University of Windsor, Douglas Kneale was in attendance to announce the winner of the first place prize. Imagine our shock when AidaNote was called up for the third time to accept an award. We were shocked and humbled. “Speech! Speech!” I couldn’t muster any words. Stevan, who is clearly very good under pressure, thanked everyone for coming out and the hosts of the event. This quality was what won us the first prize; the top three teams were separated by one point. We spoke with the judges, who told us that the way Stevan handled the failed demo was what gave us the extra point to put us ahead. I want to thank all of the teams who came out this weekend, some as far as eight hours away. We got to meet like-minded individuals and see some amazing presentations. AidaNote is set to launch in the Fall of next year until then our team will be hard at work developing.